(Update, we’ve pleased to have finally received a reply from Lincoln University. In the interests of fairness we’re posting that statement prominently in bold here and have updated the article and relevant questions in response to the information received. Readers should note that Bindel describes herself as “Research Fellow, Lincoln University” on her Twitter profile, we’d suggest Lincoln University actually deal with the source of this false information (Bindel herself) rather than sending us emails suggesting we consider taking this article down for merely repeating information from Bindel’s profile. Also if they could actually answer some our question about why they choose to associate with hateful concentration camps supporters than that might be a good idea too. Anyway, our sincere apologies to the University of Lincoln for believing sexist and hateful people associated with their institution. We’ve had an incredible response to our article about Julie Bindle’s recent hate comments. For the unaware, Bindel recently finally came out as a literal feminazi, proposing compulsory guarded concentration camps for all men and even indicating she regarded males as sub-human. The story has been translated into a number of languages, and our international readers have produced a petition asking the Guardian to relieve Bindel of her position s a writer for the newspaper. For the record, we (and quite a few others) think the Guardian’s involvement here is the least pressing issue. They, like Bindel, have a long record of publishing hate comments about men and therefore in many ways she’s the perfect fit for the publication. How are Bindel’s extremist and blatantly hateful views about all males compatible with the University of Lincoln’s “commitment to equality and diversity”. In particular, how does the presence of such an extreme and committed misandrist fit with your commitment to “actively promote an organisation culture where individual difference is appreciated and respected, ensuring equitable and fair treatment for all”. Also, how does the employment of giving this title to Bindel “actively foster an environment that is free from unfair and unlawful discrimination and harassment” and the universities stance against discrimination on the basis of gender? Is there not a most severe conflict between Bindel’s views and the University of Lincoln Code of Ethics? I note that said code has an entire paragraph dedicated to “Respect for others” which states “The University respects the intrinsic worth of each individual and takes pride in its diversity. Lincoln is an inclusive community committed to equal opportunities.” Is it really respectful to regard all male students and staff as sub-human and is her proposal to imprison all male students and staff in concentration camps “ethical behaviour”? I’m sure you’re already aware of the vast gender education gap that currently blights the higher education system with many university leaders now regarding males as a disadvantaged group. What is the gap for the student population at the University of Lincoln as a whole and in the the School of Health and Social Care in particular and what are your polices and plans for tackling this issue? Won’t the employment use of extremist man-hating feminists further worsen what is already a hostile environment for male students and actually further increase inequality by worsening the gender education gap rather than reducing it as is needed? The University has various safeguarding commitments and claims take student safety very seriously. Can male students really feel safe on campus if there is a presence of extremist staff visiting research fellows who hate them because of their gender and wish to place them in concentration camps? Is Bindel allowed near men on campus, do you currently use a chaperone for Bindel to ensure she doesn’t not attempt to harass or attack males at the university? Who recruited Bindel to work the position of visiting research fellow at your institution and who does she report to? Are you or they already aware of this scandal and her previous hate and extreme discriminatory attitudes towards males and if so what steps were taken to ensure such attitudes did not impact on the department or her research? Exactly what type of research is Bindel conducting at your institution? Does it in any way whatsoever relate to her concentration camp plans or gender? Do you really think any research by this individual could be of the slightest value, remotely honest or credible given her hateful and extremist views about half of humanity? Furthermore, doesn’t her very presence at your institution severely damage the reputation and credibility of your department, particularity any staff working associated with Bindel or in the same subject area? Can you confirm if Bindel is still presently a patron of your organisation or is the website out of date? What is your organisation’s position of Bindel’s hate comments concerning the promotion of concentration camps and view of men as sub–human? Do you not feel there’s a conflict between having such a hateful sexist man-hating individual as a patron for your organisation and your claim to be “opposing sexist violence:”. Isn’t Bindel’s fondness for concentration camps at odds with your goal of “promoting equal rights”? If For Our Daughters genuinely is against “sexist hate crime” as claimed on your website, then it isn’t wrong to have a patron supporting the most extreme of said crimes? You also claim to be against sexist violence targeted at women becasue of their gender yet your patron supports the very same thing target at men. Surely this is completely inappropriate and would severely damage the reputation and credibility of your organisation should Bindel remains in her position? Regardless of the views of your organisation with regards to Bindel, do you not feel they fundamentally conflict with those funding your organisation such as the Joseph Rowntree Foundation? Are all the other patron’s aware of Bindel’s role at your organisation and her long-standing hateful views about half of humanity? What action have you taken or do you plan to take in regards to this matter? It doesn’t appear that we’ll be hearing much from Bindel on this story. 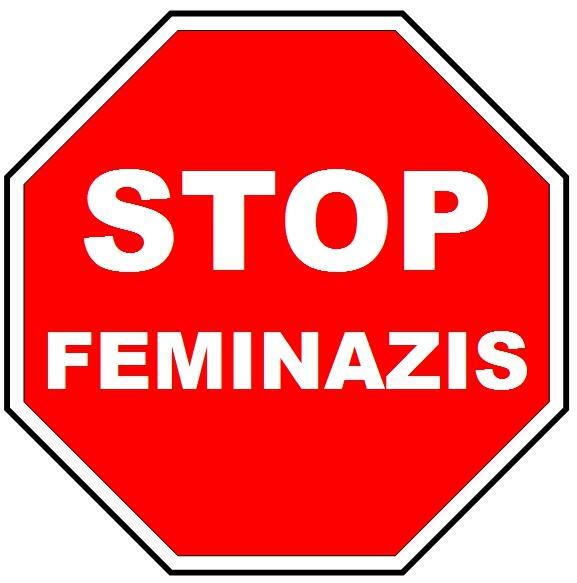 The radfem blog which published the infamous Femminazi interview took down the article in question, but only so they could delete all comments and block people from having their say and the article is now back up in locked-down form, you can still see an archive of the original here. We’ve just noticed that the HEqual account is now also blocked by Bindel on Twitter, which really is quite the badge of honour for anyone campaigning for gender equality. Feminists regularly complain about the use of terms such as “feminazi” as if it’s an outrageous and completely unjustifiable slur, yet Bindel’s proposals and de-humanising language might as well be lifted from a Nazi manifesto and the silence from feminists in condemning her (and all those listed above) is deafening. Feminists have plenty of time to get outraged by a harmless shirt worn by a respected scientist, they’ll misrepresent a clear joke by Tim Hunt to get him fired from his job. They’ll campaign endlessly about how men sit on trains and assault them if said seating position is not to their liking, and then next priority on their agenda is to interfere with the way men go to the toilet. However, it’s now a week since one of the most high profile feminist commentators openly suggested putting all men on concentration camps until they became human beings and there’s not a word on condemnation anywhere. Until that changes and feminists start condemning misandry instead of celebrating it then the feminazi term is quite clearly 100% justifiable and particularly so in reference to anyone associated with Bindel or the organisations she works for. The Bindel concentration camps story is very much an ongoing and expanding scandal and we’re investigating further significant development which we’ll cover in an article in the next few days so please subscribe to the blog or follow us on Twitter and retweet our work or share it elsewhere – it really does have an impact as shown by this very issue. Donations are of course much appreciated if you’d prefer to support our work that way too. Bindel is clearly a piece of work, to say the least. She is also intent on making a name for herself, and a living, from being a professional Feminazi and as such has to be seen to make the running in misandrist statements and establishing her sexist bona fides. Thus her comments on concentration camps, for example, need not be taken seriously. However, they will still do harm to men in the eyes of unsophisticated persons – who all have the vote too. She knows this and could not care less what damage and grief she causes in culpable pursuit of her own selfish advantage. It is right, therefore, that she be called to account and questioned on her statments as though they were real and meant anything. Ms. Bindel appears to have benefited from a list of ill defined “posts” at Universities over the years. One presumes sinecures secured for her by her friends.